For the album by Prime Suspects, see Guilty 'til Proven Innocent. (2001) "Guilty Until Proven Innocent"
(2000) "Guilty Until Proven Innocent"
(2001) "Only the Loot Can Make Me Happy"
"Guilty Until Proven Innocent" is the third and final single from rapper Jay-Z's 2000 album The Dynasty: Roc La Familia. It features production by Rockwilder and a chorus sung by R. Kelly. 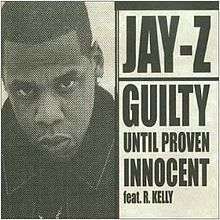 The song's title flips the legal declaration "innocent until proven guilty" and its lyrics follow suit. Jay-Z's lyrics deal with how the press villainized Jay-Z by accusing him of stabbing his once business partner Lance "Un" Rivera. Ironically, Jay-Z would later admit to stabbing Rivera and was sentenced to 3 years probation for the incident. "Guilty Until Proven Innocent" is also one of the first collaborations between Jay-Z and R. Kelly before they released two albums together. On June 12, 2001—three months after the release of the "Guilty Until Proven Innocent" single—a DVD named The Making of Guilty Until Proven Innocent was released. The DVD helps explain the making of the Paul Hunter-directed music video that shows R. Kelly and Jay-Z rapping in court. Buckshot and 9th Wonder sampled this song on their Food for Thought song from the album Chemistry in 2005. The music video for this song is directed by Paul Hunter. R. Kelly and Jay-Z does not have a scene where they are together in this video, but separate scenes.